MSE represented six Anchor Academy students who were injured while being driven by an employee of Defendant Anchor Academy Charter School. The Anchor employee was driving a suburban of nine students at the time of the accident, even though the suburban had a maximum capacity of seven people. Some of the students were unbelted and some shared seat belts. As a result of the collision, at least two students were ejected from the vehicle. All of the other occupants were also injured, some quite severely. Mr. Grays sustained a severe low back injury when a van made a left turn into his work van at the intersection of Old Bayshore and North 10th Street in San Jose. As a result, he was unable to return to work as an HVAC service technician. This personal injury case involves a building code inspector who was severely injured in a construction site accident while investigating an apparent roof leak. Mr. Marin was struck from behind by the right rear tire of a very large Telehandler forklift driven by a foreman for electrical sub-contractor Westech. The Telehandler’s backup beeper, which was designed to act as a warning device, had been disconnected, so Mr. Marin heard nothing before being struck by the large tire. This wrongful death action arose out of an industrial explosion. The decedent Ivan Terrones was attempting to repair small holes in an old fuel tank by welding with an oxy-acetylene torch. As soon as decedent approached the tank with the lit torch, the tank exploded and instantly killed Mr. Terrones. This personal injury case involved a large fire conflagration that occurred on a chicken ranch outside Hanford, California. Plaintiff Luis Gutierrez, a ranch foreman, was operating a tractor and pulling behind him a 2010 Poultry House Flame Sanitizer. Driving through a chicken house, Mr. Gutierrez heard a hissing sound from behind him, and looked over his right shoulder to see a white liquid mist. The mist quickly erupted into flames, which grew dramatically and severely burned the plaintiff. This matter arises out of a shooting that occurred at Colima’s Fade Shop in Manchester Mall in which Plaintiff Rafiola Binger was shot and suffered injuries. Manchester Mall is owned and operated by defendant Omninet Properties Manchester, LLC and their affiliates. Ms. Binger suffered a gunshot wound to the left flank and was rendered a paraplegic. The son of an owner of Yosemite Linen Supply, Inc., who was driving northbound in a company vehicle on SR-41 while intoxicated, crossed the center divide line, impacted the plaintiff’s vehicle head-on and caused a third vehicle to go off the road over an embankment. Randy Royal, a K-9 California Highway Patrol Officer, was driving on SR-99 behind a commercial tractor towing a trailer when the left rear tire and rim detached from the trailer and rolled into the plaintiff’s lane. The tire and rim bounced underneath Royal’s vehicle, causing it to catapult into the air and land forcefully. Mr. Royal suffered severe injuries to his spine. Kisling v. Mink Trucking & Excavation, Fresno Superior Court, Case No. 13 CE CG 02412 KCK, Settlement: $1,000,000.00. Christopher Kisling and his wife Deanna Kisling were driving northbound on Academy Avenue with no traffic control when a dump truck pulling a trailer pulled from the Stop sign and impacted the driver’s side of the Ford. This caused the driver’s door to pop open and both Mr. and Mrs. Kisling fell out of the car, sustaining traumatic brain injuries. Construction worker Frank Lathrop was working on the roof of a Petco building that was undergoing construction when he fell through a roof access hole that was concealed by an unsecured plywood covering and landed 20-feet below on the cement. Plaintiff Scott Waldie, a pest control inspector for Good Cents Pest Control, Inc., went into a basement to set traps via ladder, when the ladder became unsecured and Mr. Waldie fell into the basement. He suffered a severe traumatic brain injury from the fall. Plaintiff Susan Reyes was driving on SR-99 in Bakersfield, California when a corner iron securing a load of empty crates on a Lion Raisins, Inc., tractor-trailer became unsecured, flew through the air, went through her windshield and hit her in the head and skull. Ms. Reyes sustained an open comminuted fracture to her skull. She had a bone penetrating brain injury along with a documented diffuse axonal brain injury. This vehicle accident occurred outside of Shaver Lake on SR-168 in Fresno County. The plaintiff and his family had pulled over in a designated area to put on snow chains when the defendant, driving a Ford F-550 truck that weighed over 10,000 pounds, lost control driving downhill and crashed into the plaintiff’s vehicle. Tanya L. Rader and Jose L. Rader v. County of Tulare, Tulare County Superior Court, Case No. 07-225967, Settlement $2,410,000.00. Joseph Dillard Armstrong, a correctional officer with the County of Tulare, was driving to work on Avenue 336 when he approached a stop sign at highway speeds and failed to notice the “Stop Ahead” sign and the “Stop” sign. He ran the “Stop” sign at highway speeds and hit Tanya L Rader and her three children. As a result of the collision all three children were killed and Mrs. Rader lived with some orthopedic injuries. Dee Anna Sloan and Gordon D. Sloan v. Brad Jacob Stephens, Elizabeth Palm, Phillis Elaine Steele, Bennie L. Steele. Fresno County Superior Court, Case No. 07 CE CG 01982 AMS, Jury Verdict, $1,085,439.15. Plaintiff Hilari Sloan was a passenger on the back of a motorcycle driven by defendant Brad Jacob Stephens. They were driving eastbound on Copper Avenue when a vehicle pulled out from a stop sign and struck the motorcycle. Both riders and the motorcycle flew over the car. Hilari Sloan sustained a severe closed head injury and massive facial injuries. She went on life support and died several days later. A Cutler-Orosi Joint Unified School District school bus was providing transportation to and from school for six-year-old Eric Gonzalez on Road 120. The school bus was hit by an oncoming vehicle during the school bus unloading and escorting procedure, severely injuring plaintiff. The bus driver violated school protocol for unloading and escorting procedures. Eric Gonzalez suffered a traumatic brain injury, abdominal injuries, bilateral femoral fractures as well as severe post-traumatic stress disorder. Brian Hall and Jean Hall v. North American Industrial Services, Inc. U.S. District Court – Eastern District, Case No. 1:06-CV-00123-OWW-SMS,. Jury verdict, net amount $15,085,948.91. This case involved a catastrophic burn incident wherein Mr. Hall sustained 65% total body burns at his employer’s plant, AES Mendota. Boilers at that location were being explosively deslagged when the incident occurred. Brian Hall was on the fifth floor when the charge was fired, a large fireball came out of the west cyclone mid-level door and traveled approximately 40 feet and engulfed the plaintiff. Alanna S. Casey v. Moya Trucking, Fresno County Superior Court Case No. 06 CE CG 00588 DSB, $1,000,000.00. Erica A. Barron v. E&B Trucking, Inc., Fresno County Superior Court, Case No. 05 CE CG 02660 MBS, Jury verdict: $1,005,925.00. This vehicle accident involved a tractor/trailer that hit an automobile, killing the mother and grandmother of plaintiffs. Donald and Mary Kay Wolfe v. Casey John Stephenson. Fresno County Superior Court, Case No. 04 CE CG 02968, Settlement, $1,600,000.00. Besselievre v. General Crane Services, Inc., et al. Fresno County Superior Court, Case No. 05 CE CG 01139 MWS. Settlement, $1,000,000.00. This case involved an industrial accident in which a forklift rolled down a ramp and fatally crushed the decedent mark Besselievre. Doe v. Doe Auto Maker, Selma Auto Mall, Inc., dba Fresno Isuzu, et al. Fresno County Superior Court, 11/22/05. Settlement, $1,600,000.00. Marilyn R. Doyle v. Mechanical Analysis/Repair Inc., Mark H. Warnert, Richard A. Leddy, et al. Fresno County Superior Court, Case No. 05 CE CG 01102 AMS. $2,500,000.00. A truck owned by Mechanical Analysis/Repair, Inc. ran a red light and impacted the driver’s door of Marilyn Doyle’s motor vehicle at 53 mph. There was an intrusion of 24 inches into her compartment. Ms. Doyle suffered fractures to her pelvis and underwent two hip replacements. Doe versus Corporate Truck. Date of Incident: March 8, 2004. San Francisco County Superior Court. Cash, $1,250,000.00. Deborah Weir v. State of California; et al. Date of Incident: May 21, 2003. Santa Barbara County, Case No. 1156445. $1,100,000.00. This case involved a motor vehicle accident in which the plaintiff had the right of way on SR -1 in Santa Barbara County when the defendant, a California Highway Patrolman in the course and scope of his employment, made a U-Turn into her path. Plaintiff suffered severe injuries to her spine. Doe 5-Year Old Girl v. Doe Retailer. Date of Incident: February 22, 2002, Traumatic Brain Injury. Fresno County – U.S. District Court, Eastern District. Cash, trust and annuity, $3,000,000.00. Kenneth Cavender, Virginia Cavender and Kurtis Cavender vs. Roe Utility Company., State Of California, State Of California Department Of Fish and Game. Fresno County Superior Court, Case No. 03 CE CG 00987 DSB, $12,000,000.00. This was an electrocution accident that occurred on the premises on the Mendota Wildlife Area operated by the California Department Of Fish and Game (DFG). The Cavenders were on the premises hunting pheasants. Unbeknownst to them, a 12,000 volt power pole had fallen the afternoon before. Kenneth Cavender stepped on a power line on the ground and was electrocuted. Calderon v. Velocity Express Intermountain, Inc., Fresno County Superior Court, Case No. 02 CE CG 02924, 12/24/03. Jury verdict, $14,300,000.00 ($15,000,000.00 paid). Morris v. Arthur & Orum Well Drilling, Inc., Gilbert Mendoza, et al. Fresno, Case No. 02 CE CG 01694 DSB, 12/15/03. Annuities, $1,000,000.00. Doe v. Doe Utility Company. San Francisco County Superior Court, 9/11/03. $22,600,000.00. Castro v. Confidential Tire Defendants. Fresno County, 7/03. Confidential. Doe v. County of Madera. Madera County, 2/4/03. Settlement, $2,500,000.00. Lisa Barnes and Keith Barnes v. Yecny Enterprises, Inc., dba Air San Luis; Talley Farms, Inc.; Estate of Charles Gordon Wiswell, Deceased; Cessna Aircraft Company; RAM Aircraft Corporation; Teledyne Continental Motors; and Does 1 through 100. Fresno County, Case No. 01 CE CG 01242, 01/03/03. Settlement, $5,000,000.00 from USAIG for Yecny Defendants; Cessna: confidential settlement. Samantha Kaitlyn Staley and Evan Thomas Staley, Minors, By and Through Their Guardian Ad Litem, Judy Menezes Staley; and Judy Menezes Staley, Individually v. Parmod Kumar, M.D. Tulare County, Case No. 01-195845, 12/12/02. Jury Verdict: $4,709,752.00 reduced by MICRA ACT to $1,504,035.57. Doe v. Russell Schott, et al. Tulare County, 10/23/02. Settlement, $2,150,000.00. Doe v. Robert Frayne, et al. Tulare County, 6/14/02. Settlement, $1,175,000.00. Doe vs. Viking Ready Mix Company, Inc. Fresno County, 4/3/02. Settlement (cash and annuity), $2,000,000.00 total. Waski v. State of California; Autonation, Inc.; Alamo Rent-A-Car; Estate of Michelle Lonnette Phillips; Granite Construction Company, Inc., as Doe 1. Kern County, Case No. 240535-RDR, 4/19/01. State of California: $4,000,000; Granite Construction: confidential settlement; Alamo/Autonation: $500,000.00. Tapia v. Faguaro Transport & Storage, et al. Fresno County, Case No. 00 CE CG 10425, 2/23/01. Settlement: $1,000,000.00. Doe v. Watkins Motor Lines, Inc., et al. Tulare County Superior Court, 2/7/01. Total Settlement: $11,810,000.00. Salazar v. Pacific Gas & Electric, et al. Fresno County, 8/24/00. Total Verdict: $1,065,000.00 to include costs. Chontong v. Parra, et al. Merced County, 6/29/00. Net Verdict: $1,663,994.00. Alexander vs. Heater (1987) 193 Cal.App. 3d 1241. Alexander vs. State of California (1984) 159 Cal.App. 3d 890. Aloy vs. Mash (1985) 38 Cal. 3d 413. California State Auto Assn. Inter-Ins. Bureau vs. Carter (1985) 164 Cal.App. 3d 257. Campagna vs. City of Sanger (1996) 42 Cal.App. 4th 533. Da Fonte vs. Up-Right, Inc. (1992) 2 Cal. 4th 593. Espinoza vs. Machonga (1992) 9 Cal.App. 4th 268. Kantor vs. Housing Authority (1992) 8 Cal.App. 4th 424. Mardikian vs. Commission on Judicial Performance (1985) 40 Cal. 3d 473. Smith vs. Superior Court (1996) 41 Cal.App. 4th 1014. Miles, Sears & Eanni is qualified to represent you on multiple levels if necessary. 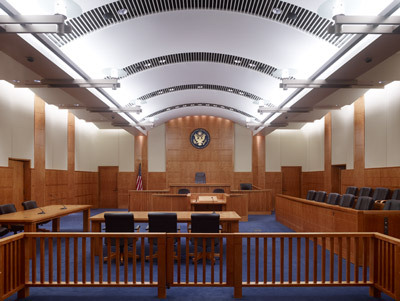 Photo of courtroom at Robert E. Coyle United States Courthouse courtesy of Lucero Design and Francis Krahe & Associates.